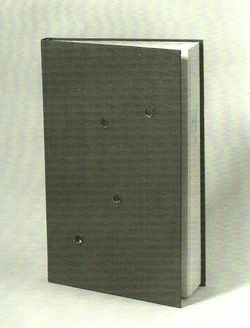 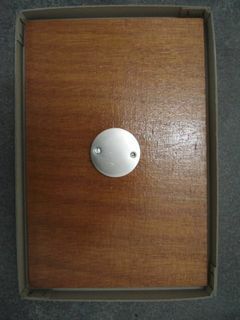 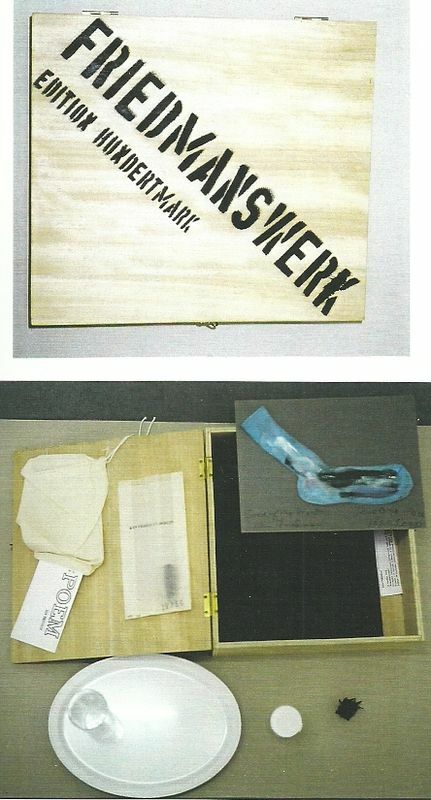 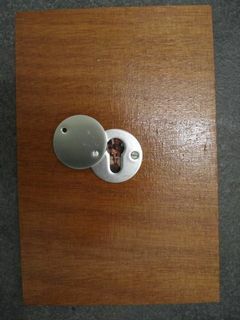 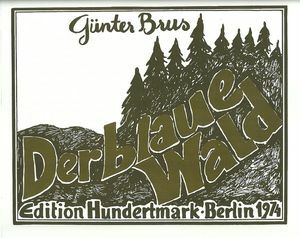 The Edition Hundertmark published the first Box in 1970. 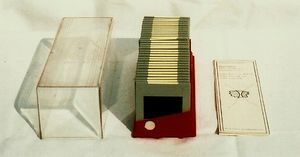 The list below describes all of the Edition Boxes from No. 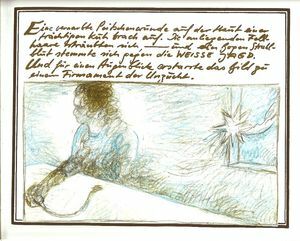 1 - 40. 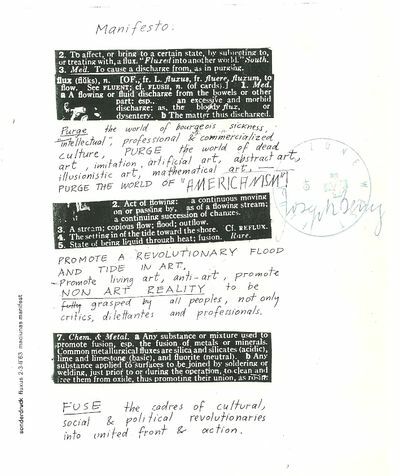 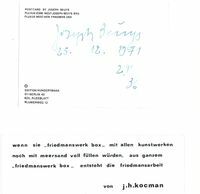 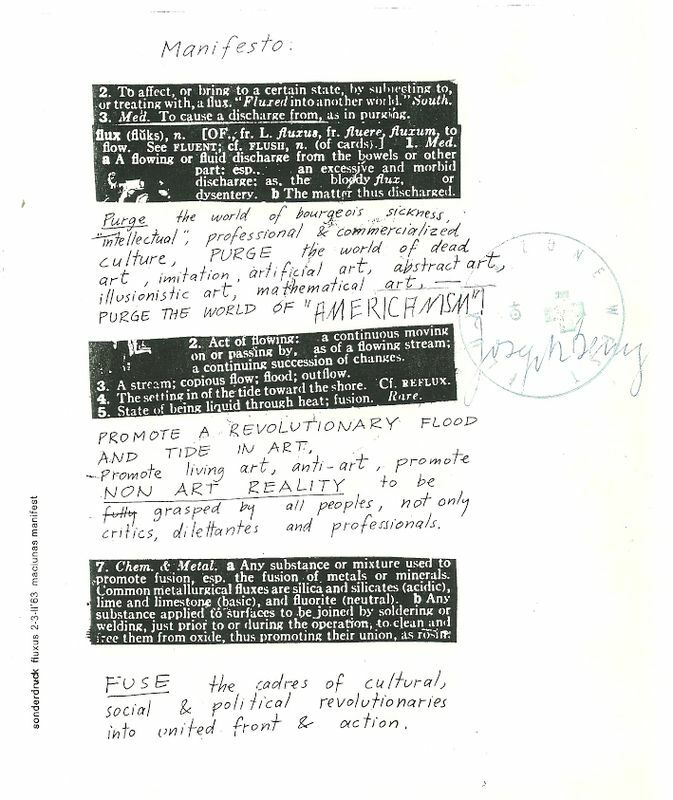 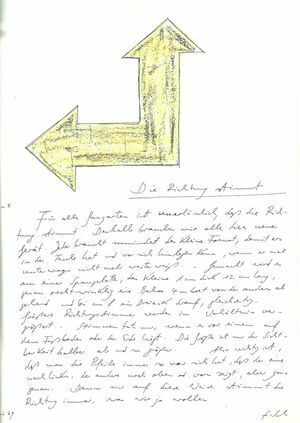 JOSEPH BEUYS: "Manifesto", "...der freie demokratische sozialistische Staat...", "Wahlverweigerung"
2 photocopies, stamped and signed and a poster. 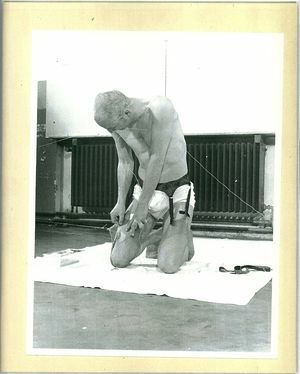 Munich 1970, performance photos, titled and signed. 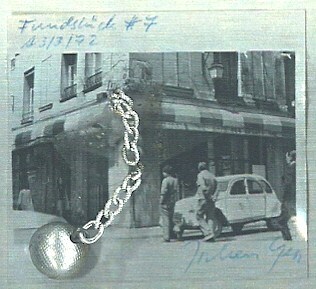 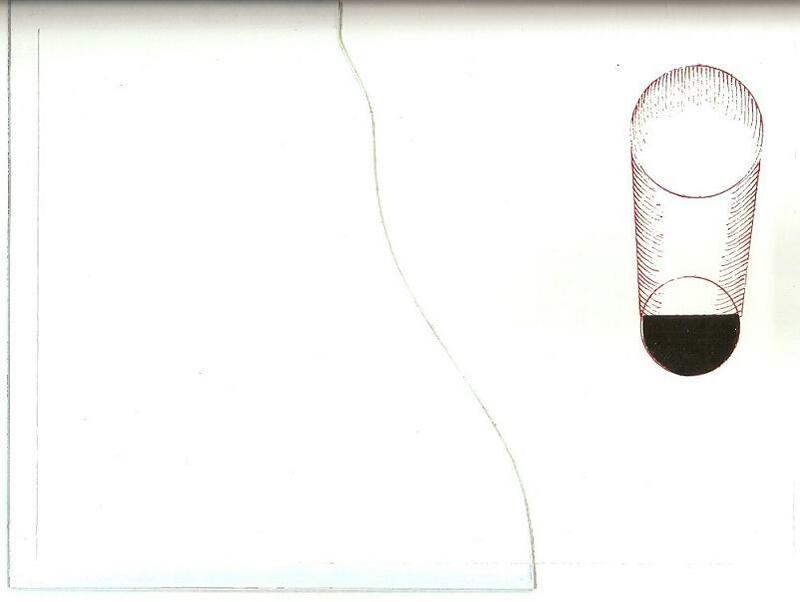 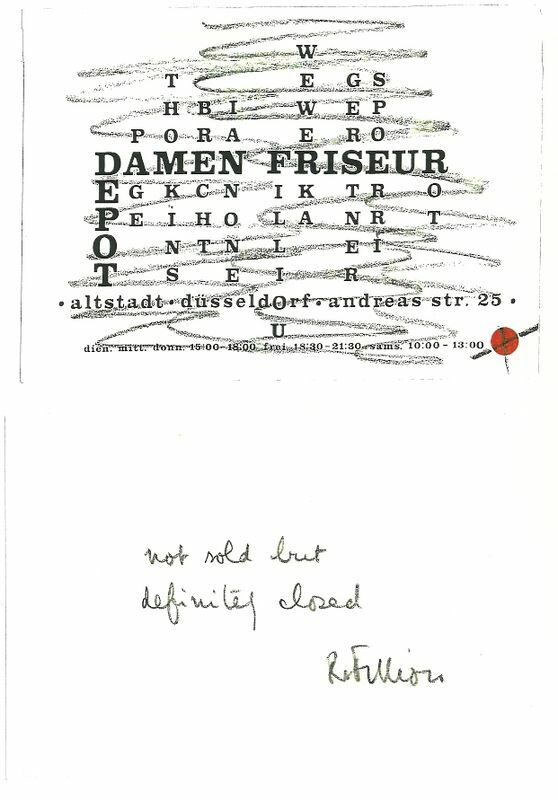 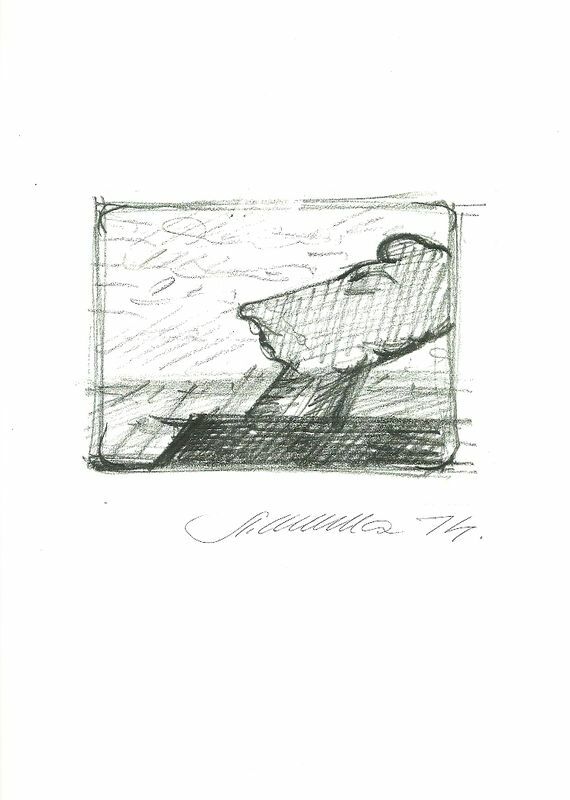 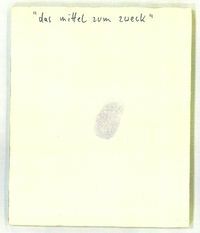 ROBERT FILLIOU: "not sold but definitive closed"
Invitation card with pencil assigned stroked, write on and signed. 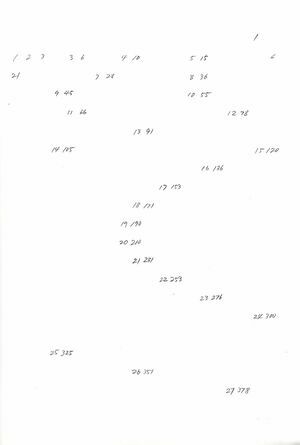 KEN FRIEDMAN: "dear sports fan..."
Two sheets photocopied and signed. 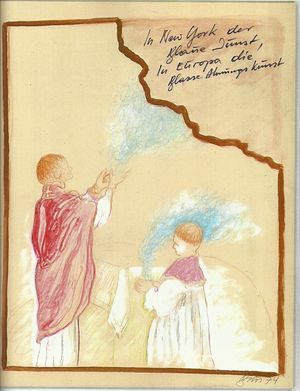 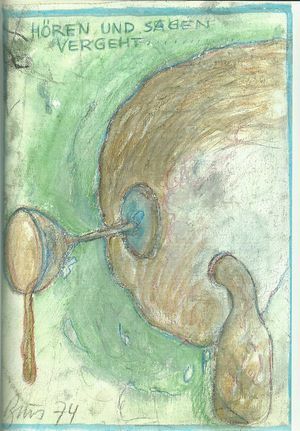 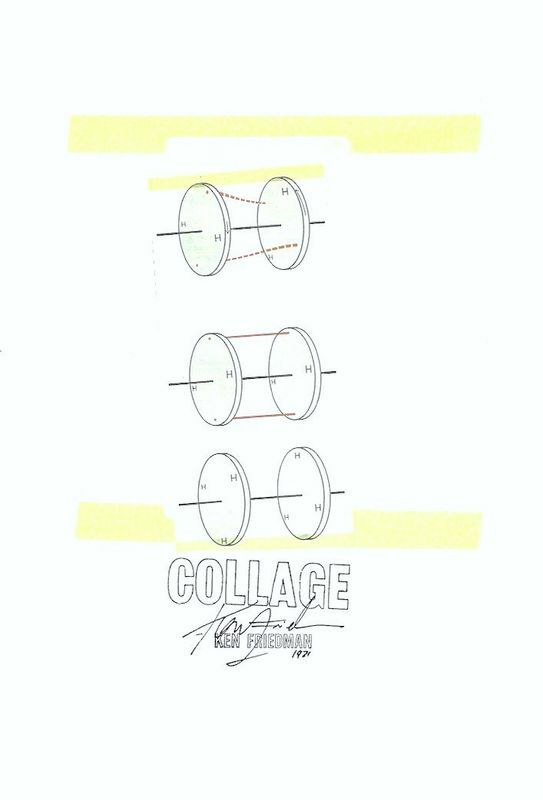 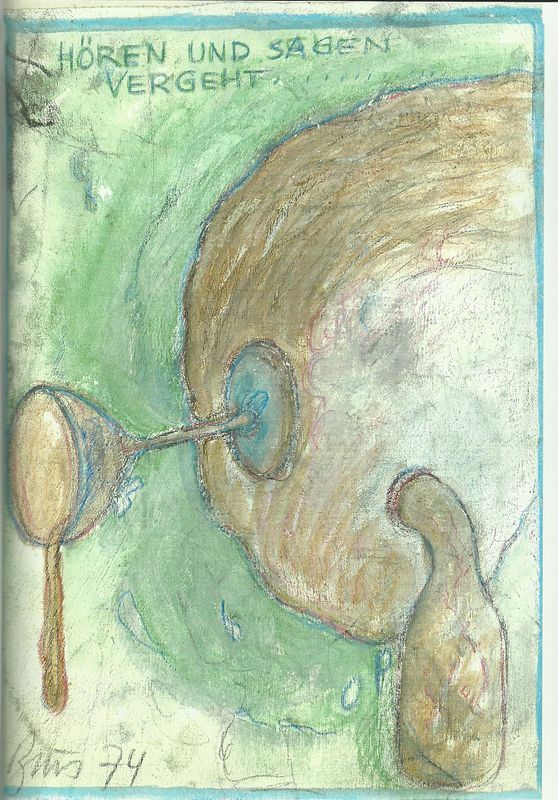 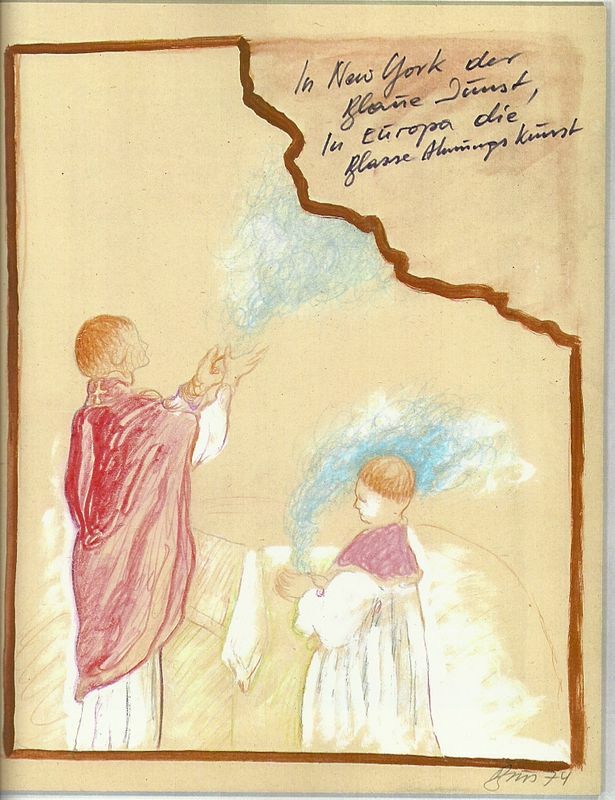 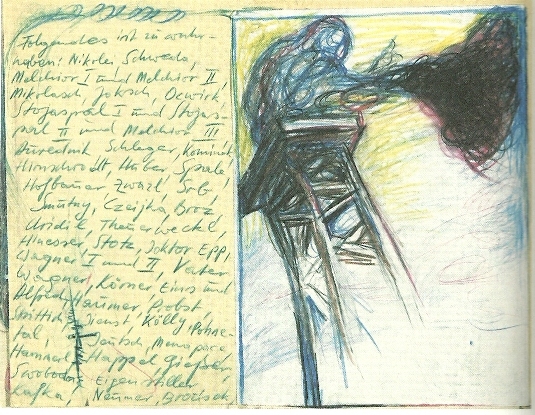 Colored drawing, titled, signed and dated. A burnt nylon shirt, signed and dated. 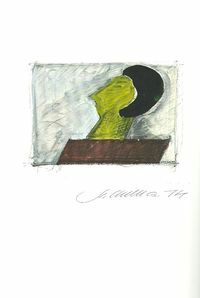 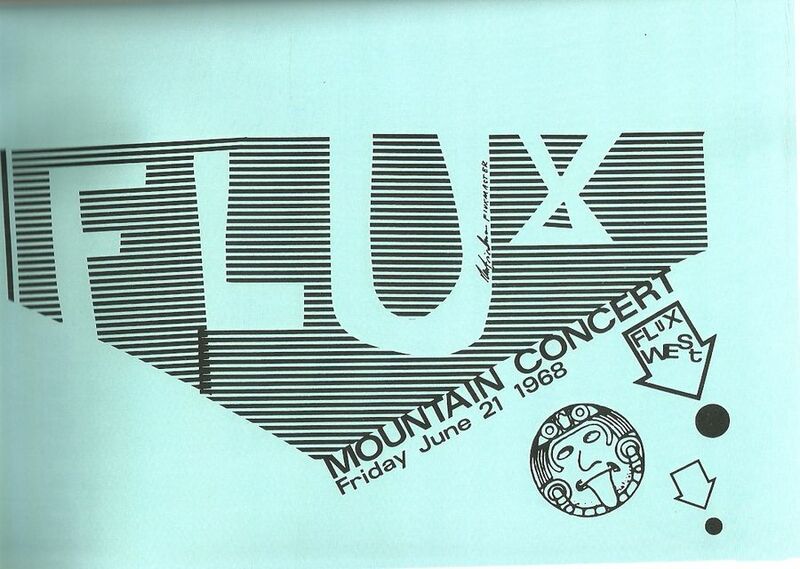 Performance photo, titled, signed and dated. 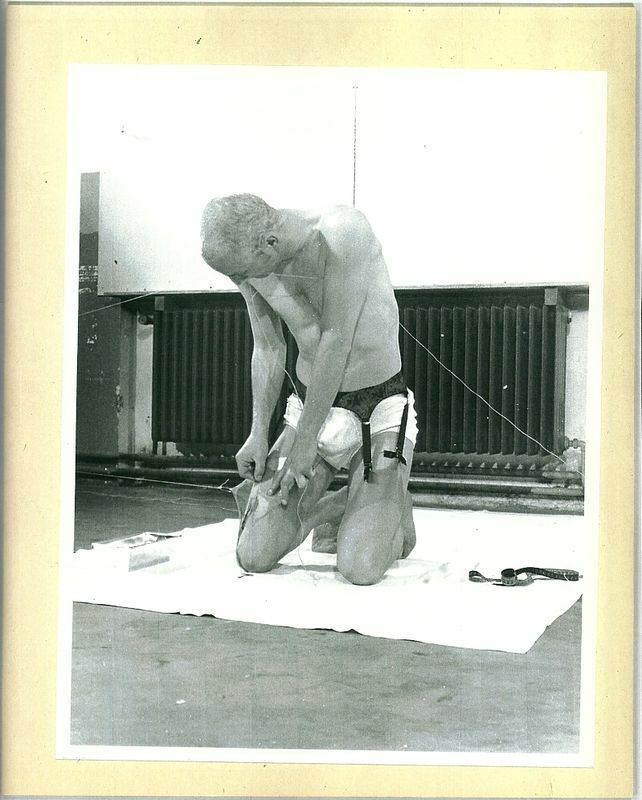 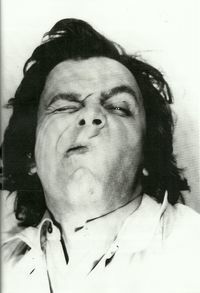 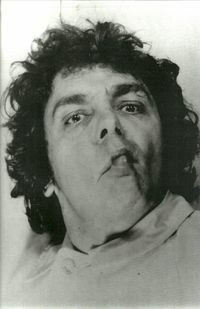 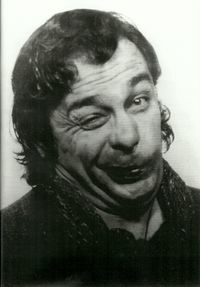 Performance photo, titled and dated. 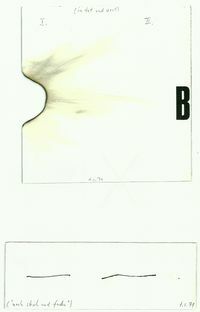 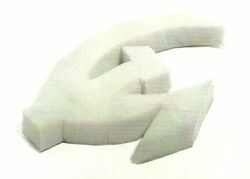 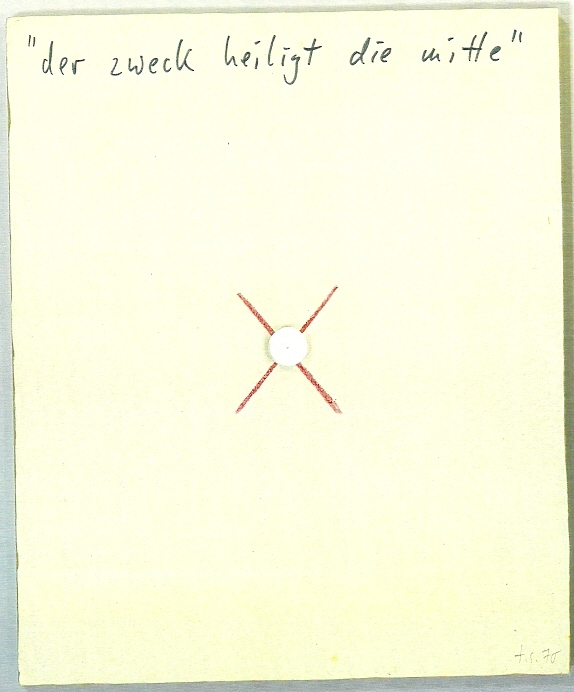 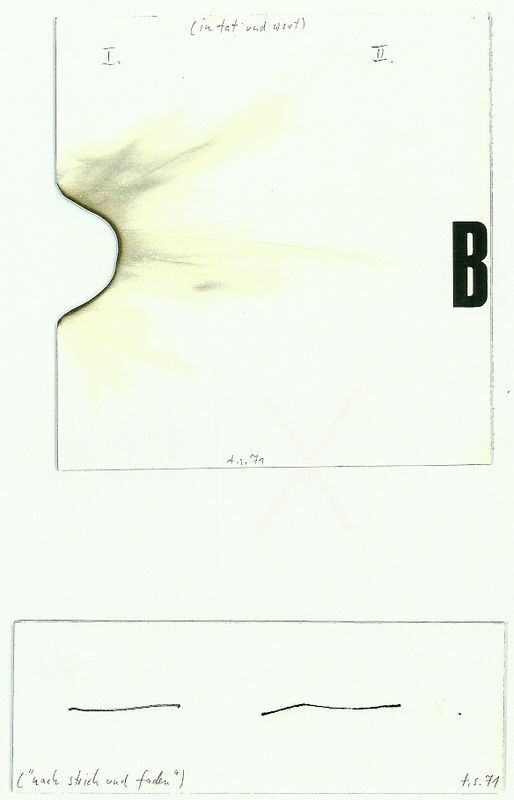 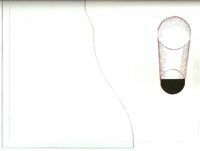 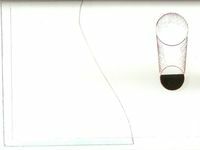 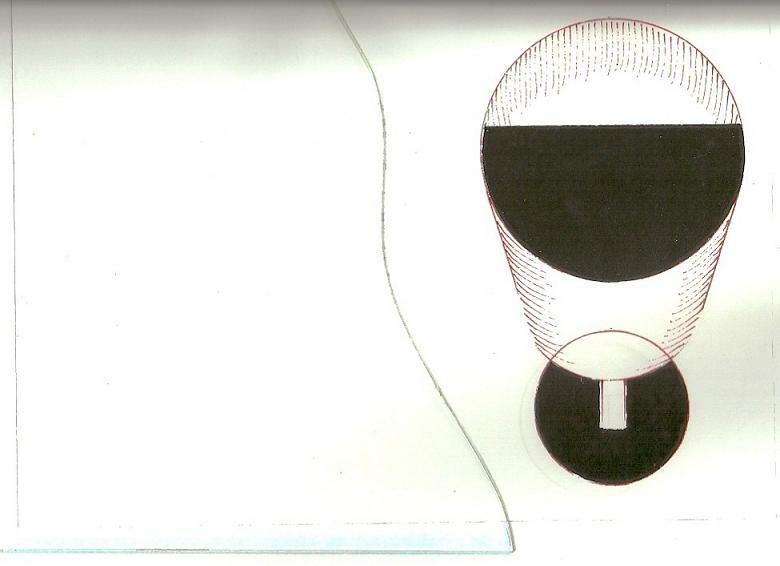 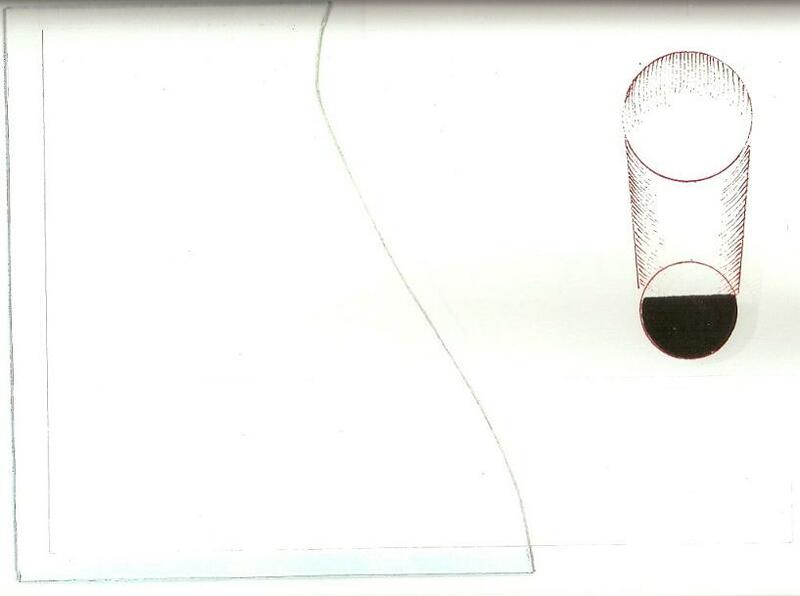 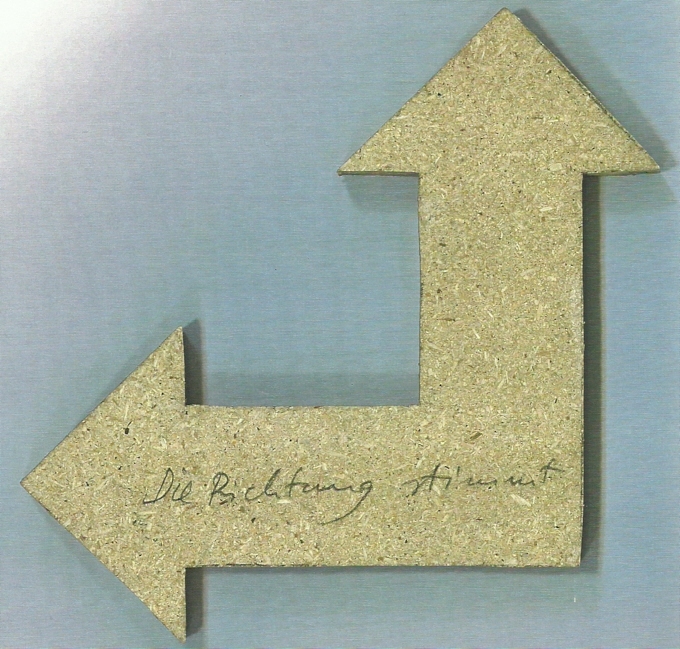 GERHARD RÜHM: "Hommage an Fontana"
A white cardboard cut, the incision is with a band-aid strip sealed again, signed and dated. 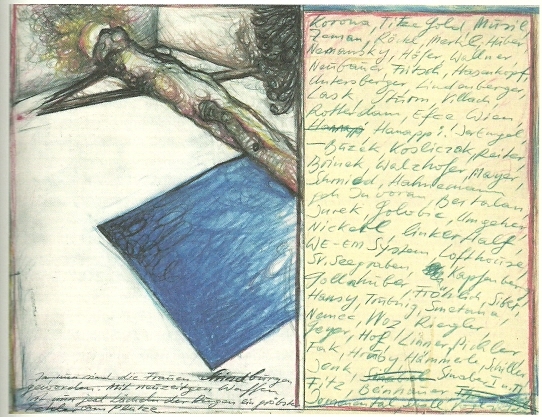 TOMAS SCHMIT: "(im freien über den kopf halten und lesen)"
A collage and a write on white box, signed and dated. BEN VAUTIER: "art is death..."
Written on a blotter, signed and numbered. 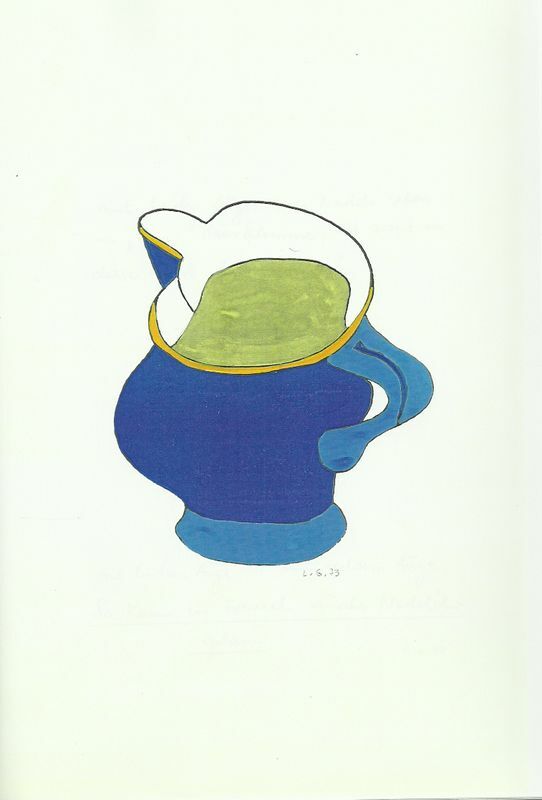 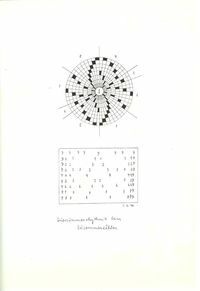 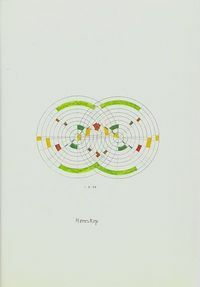 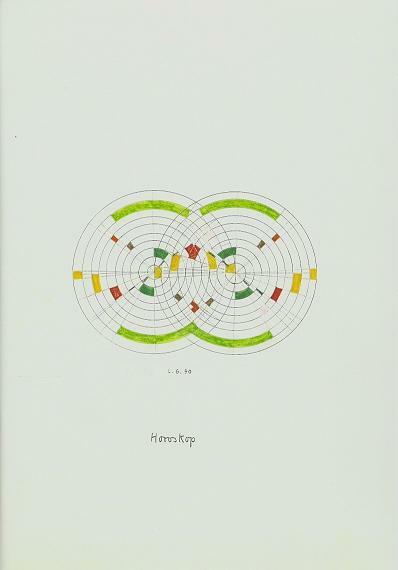 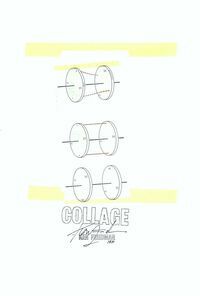 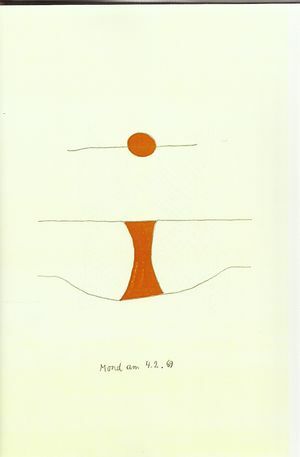 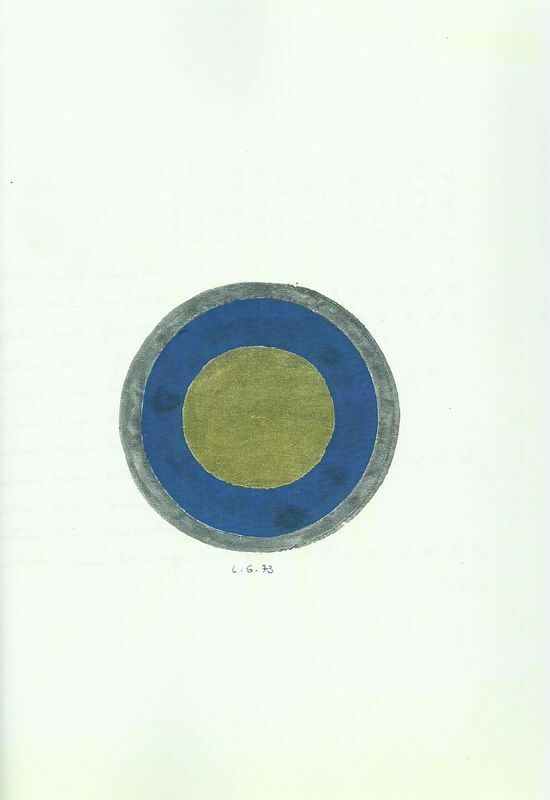 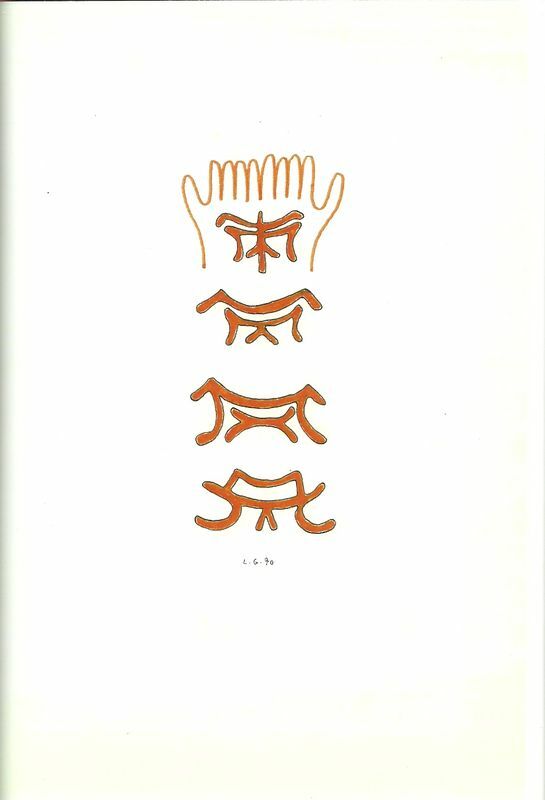 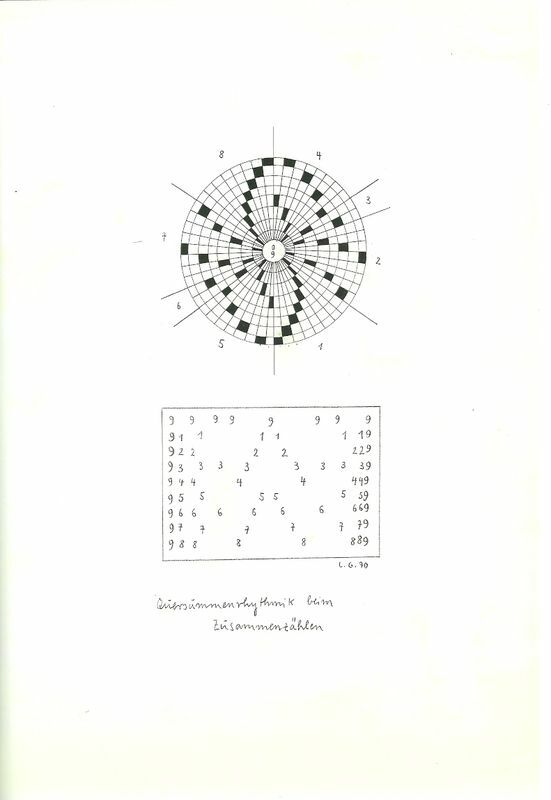 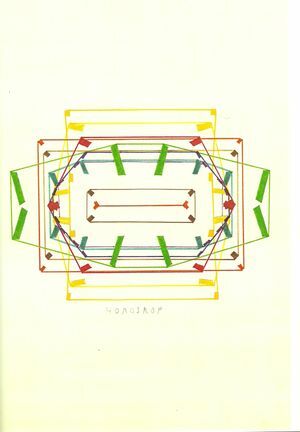 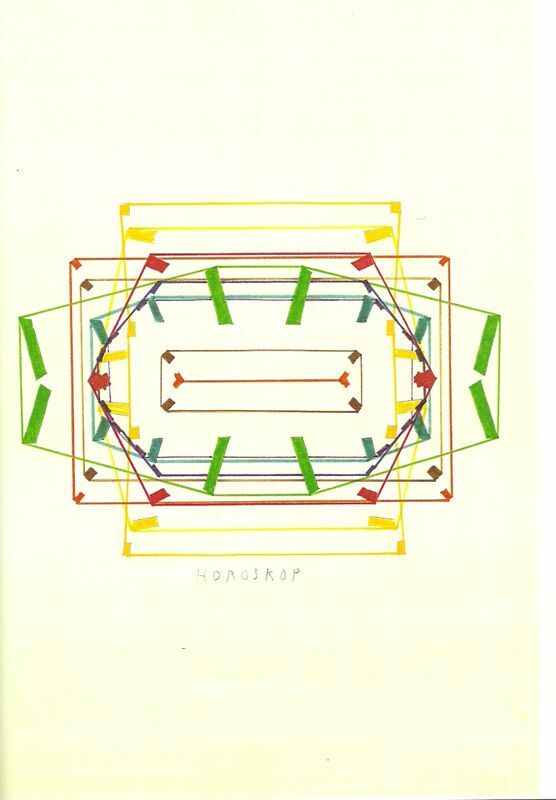 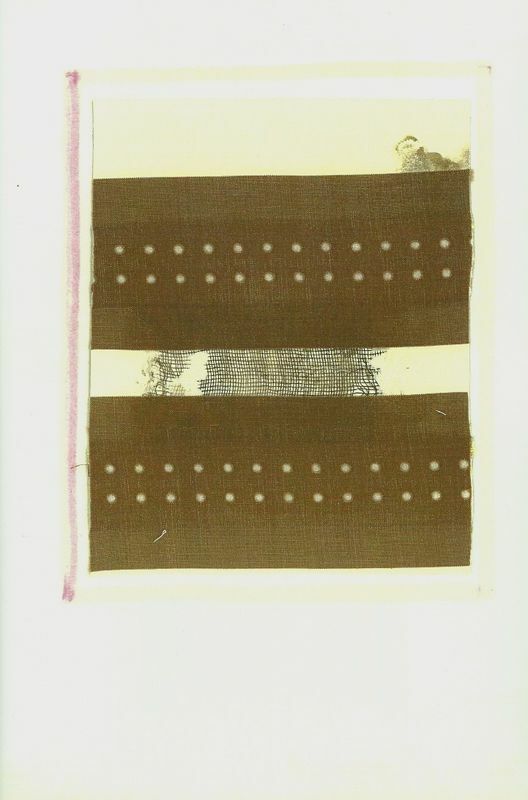 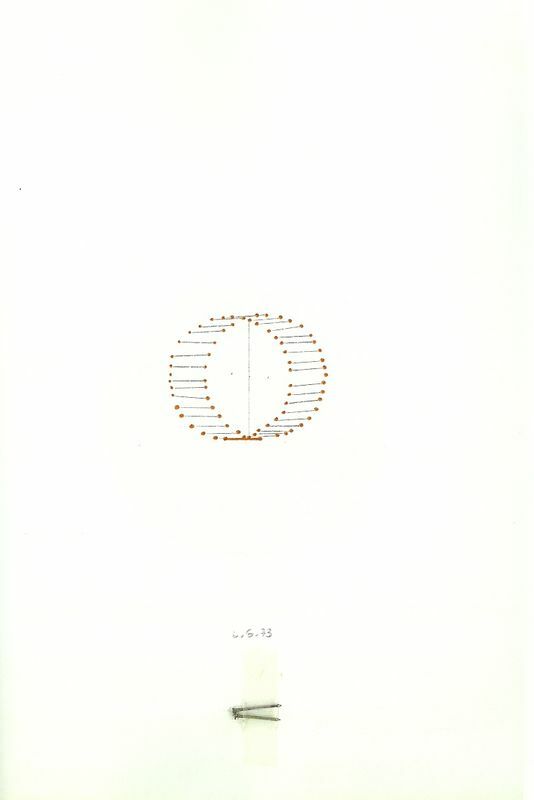 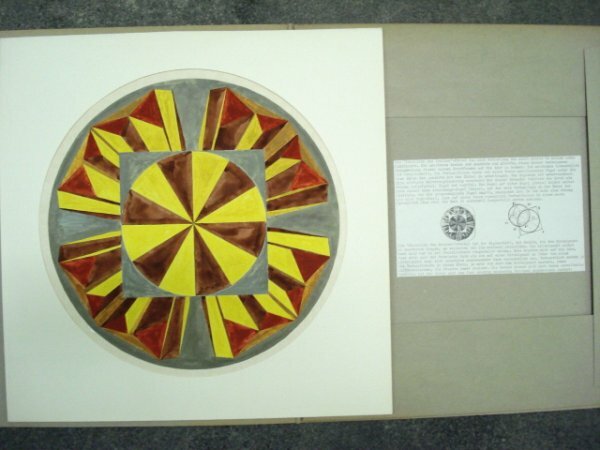 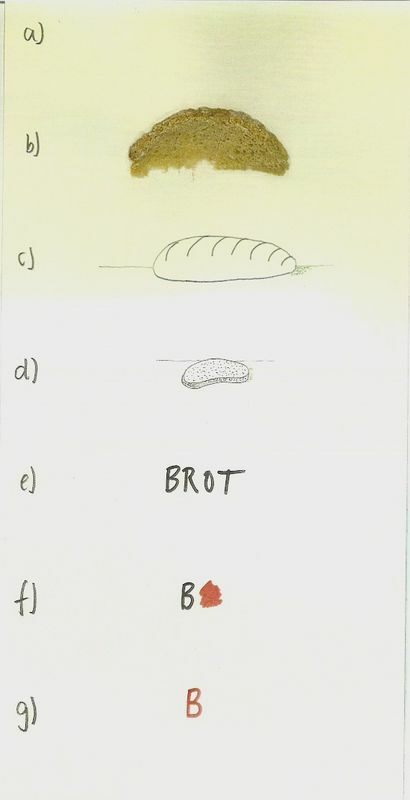 14 color drawings (pencil and watercolor), a color photo, a handwritten imprint and an index. 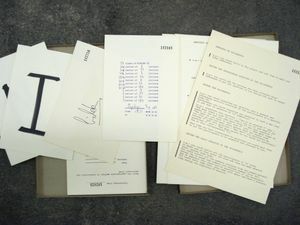 Edition of 20 copies, signed, dated and numbered. 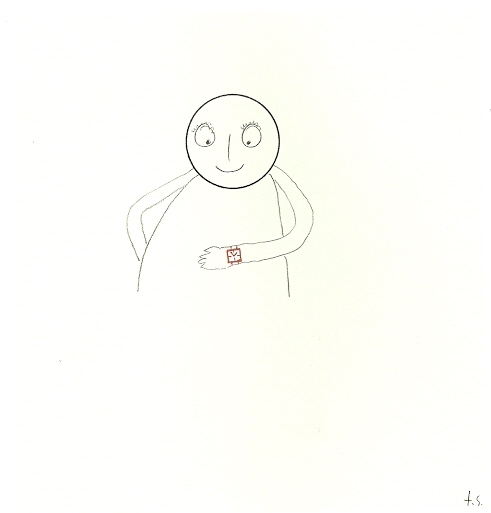 10 performance photos, 1 pencil drawing, screen print and a text by G. Brus. 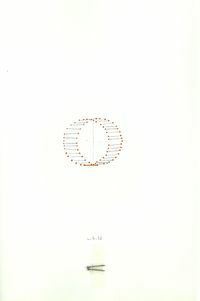 12 Face Farce photos and a handwritten title page. 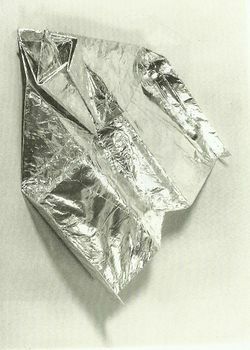 Four objects: "KILLED BOOK", "RELICT", "BODY SHIRT", "METAL PAPER GLIDER". 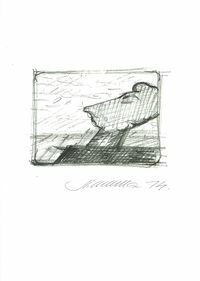 Edition of 20 copies, each object is signed and numbered. 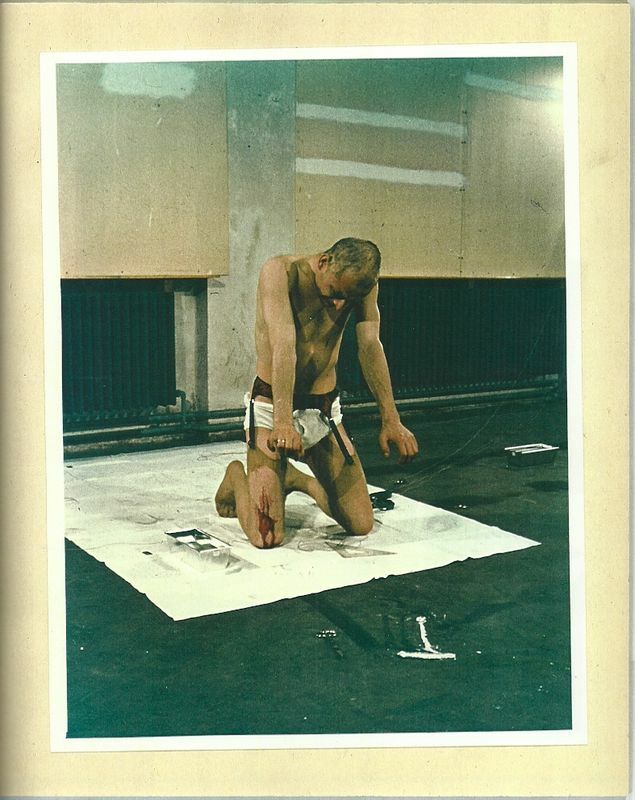 HERMANN NITSCH, "DAS O. M. THEATER"
Seven signed collages off gauze, plasters, tissues and blood and 10 performance photos. 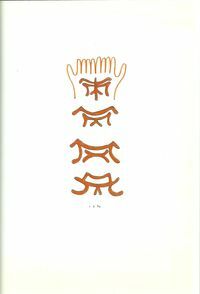 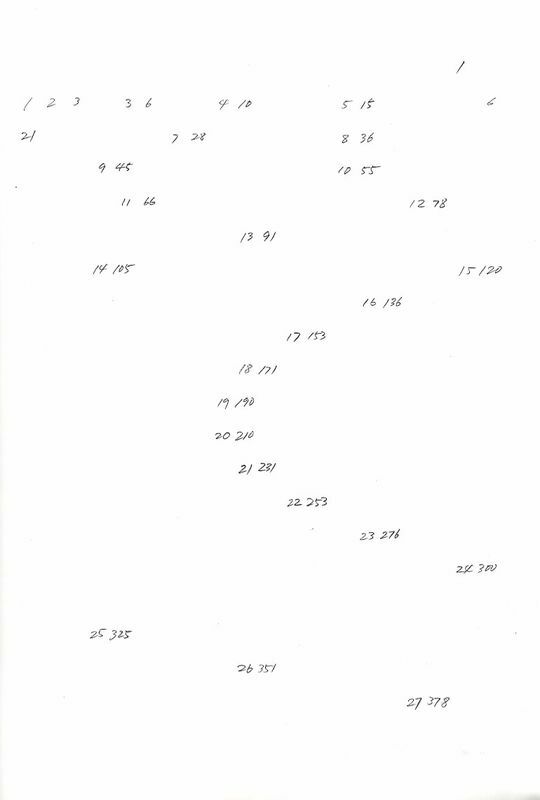 ERIC ANDERSEN, "182550 - 182949, 1st August 1971 to endless"
Four texts on one cardboard, numbered one text stamped, two letters hand written, eight postcards and one postal cheque, numbered. 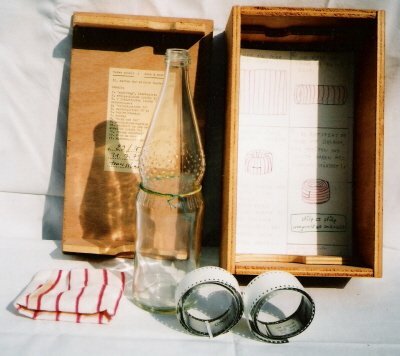 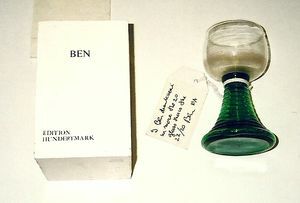 BEN VAUTIER, „I Ben drank wine in 20 glass"
Wine glass with a handwritten label in a wooden box. 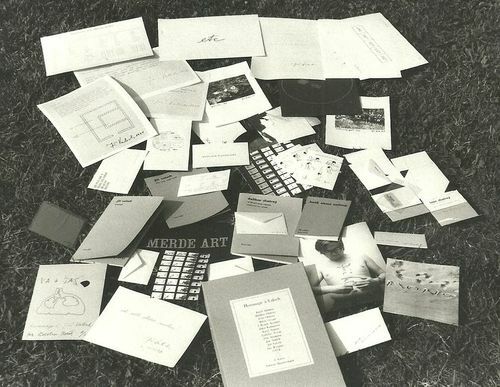 16 drawings in various sizes on cardboard, 1 drawing on flake board, and 1 photo of the author and 1 compressed moos. 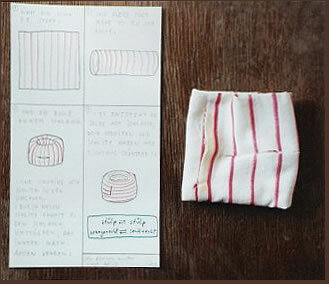 31 sheets, postcards, stickers, letters noodles collage and a Polaroid with a found object. 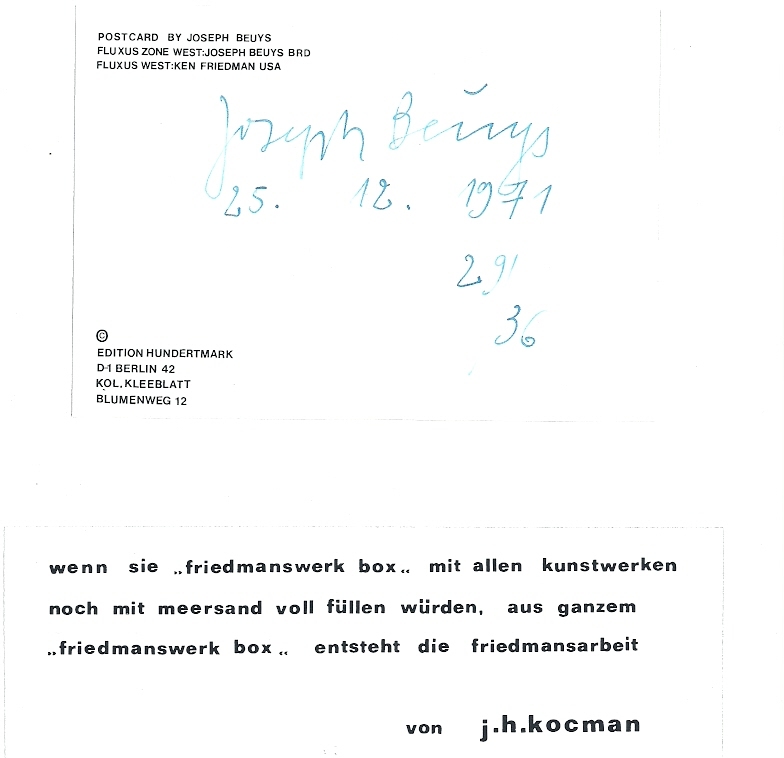 A wooden box with a collection of 45 art-works (drawings, collages, photos, multiples and texts) by Friedman, Joseph Beuys, Monte Cazazza, Fletcher Copp, Milan Knizak, Alison Knowles, H.J. 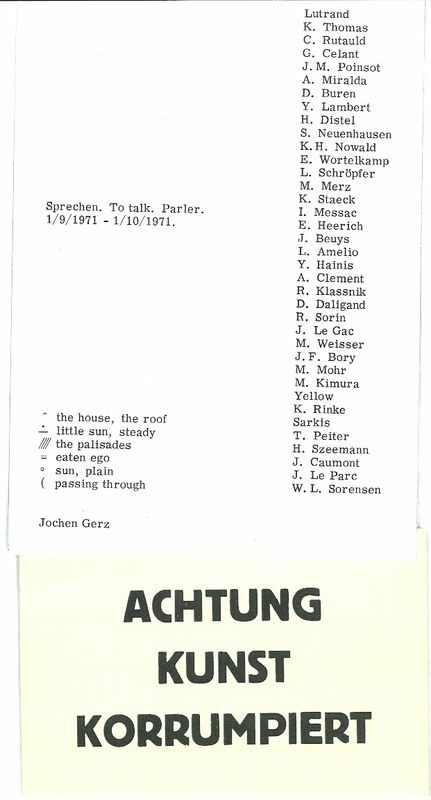 Kocman, Jiri Valoch and other. 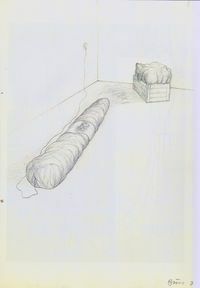 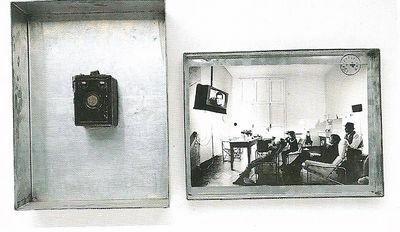 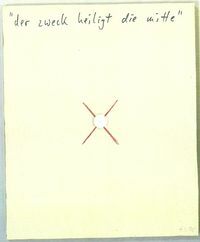 JOSEPH BEUYS, "Enterprise, 18.11.72, 16 o`clock"
A zinc box in which a camera (box) is attached. 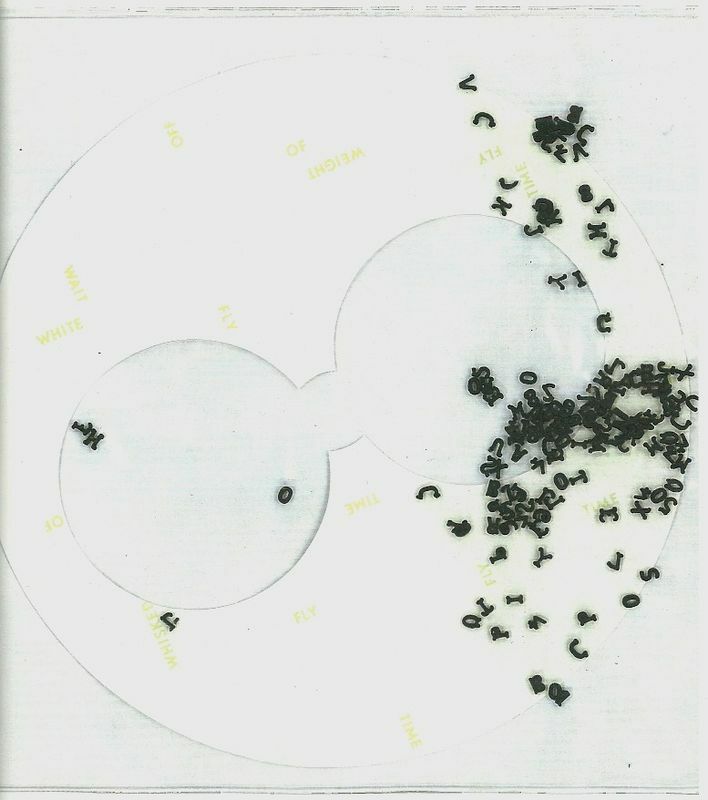 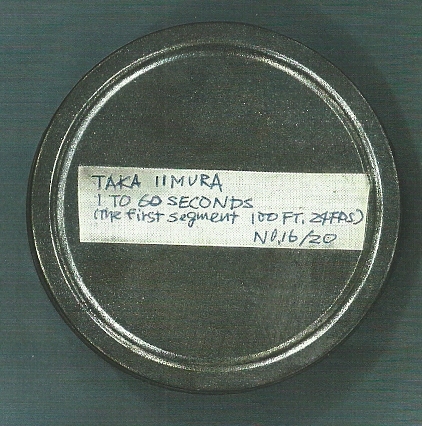 The lens was covered with a piece of felt. 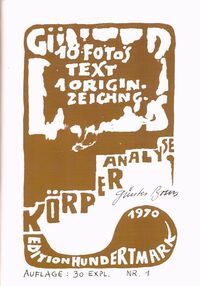 At the cover is a photo by Michael Ruetz, which shows the family Beuys looking at the science fiction television series "Enterprise". 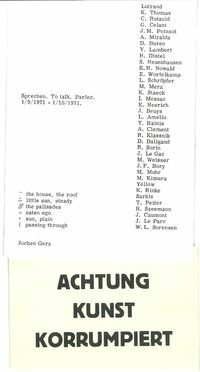 JIRI VALOCH, "Hommage a Valoch"
40 works (drawings, screen prints, collagen, postcards, handwritten and stamped texts, one folding object and one cardboard sign with silver embossing) of Jiri Valoch, Karel Adamus, Dalibor Charteny, Ivan Charteny, Milan Grygar, J. K. Kocman, Karel Nepras, Ladislav Novak, Petr Stembera, Jan Steklik and Jan Wonjar. Edition of 33 copies signed from all artists. 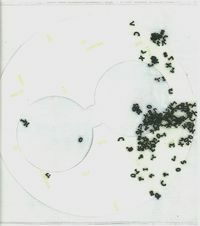 16 drawings in various sizes, 1 photo and 1 compressed plant. 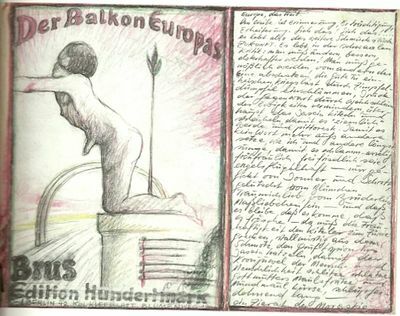 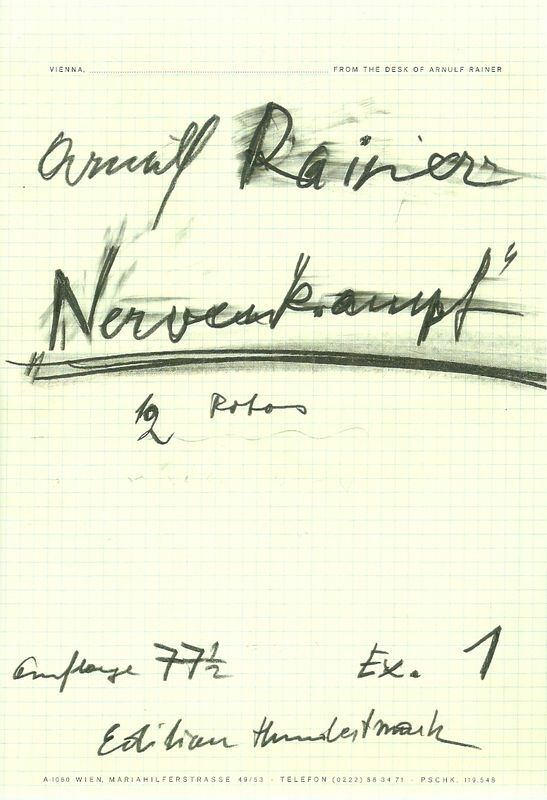 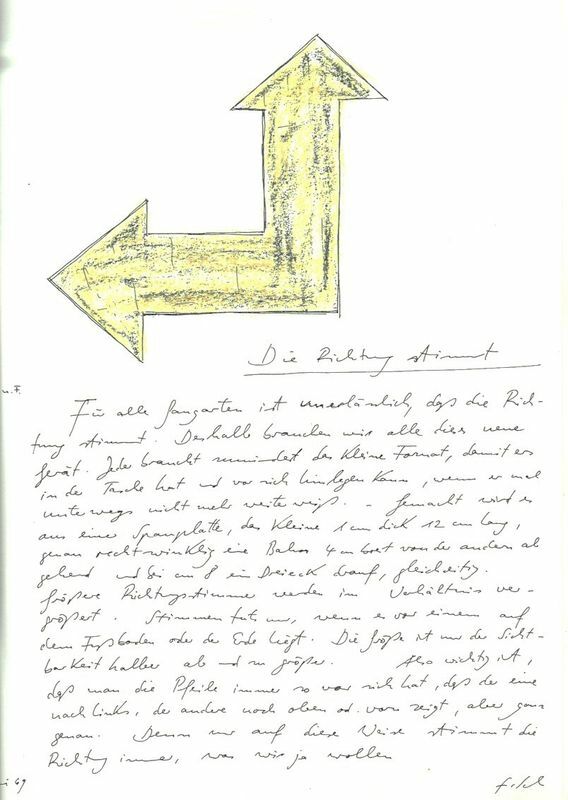 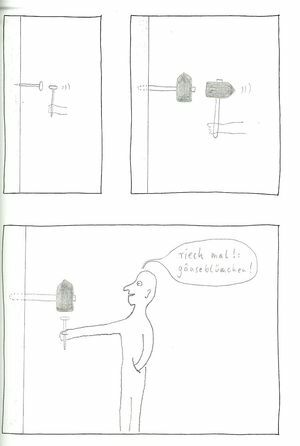 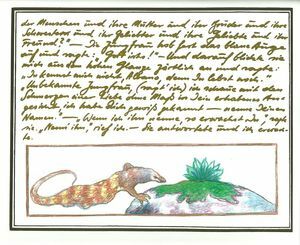 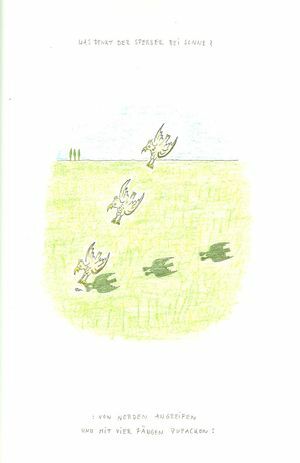 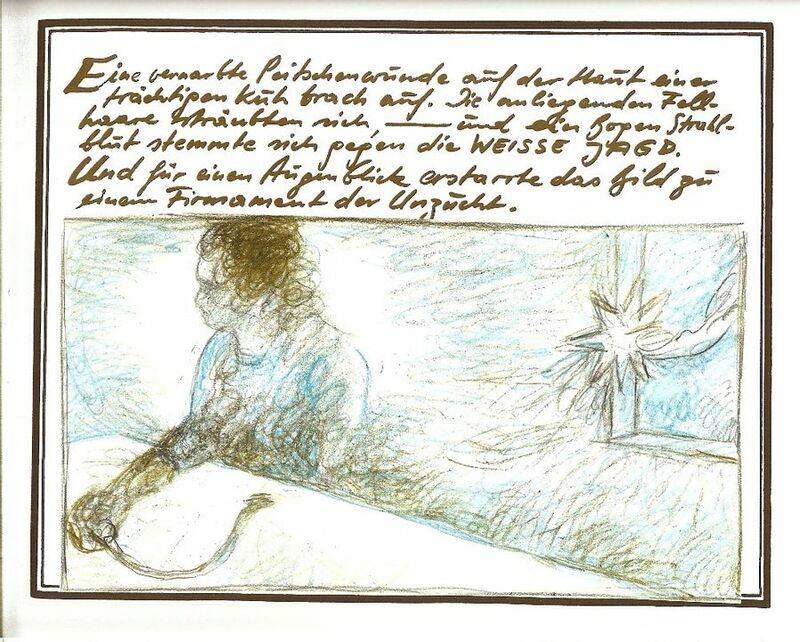 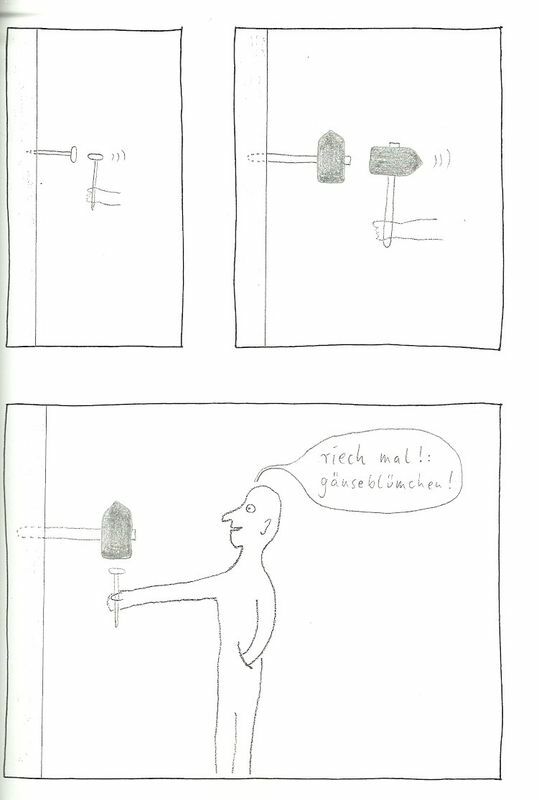 GÜNTER BRUS, "Der Balkon Europas"
A picture poetry, colored drawings and handwritten text, five pages. On the box is a silver-screen printing. 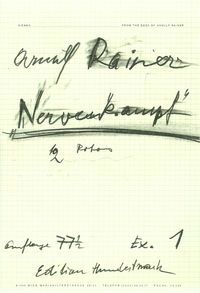 Edition of 30 different copies, signed. 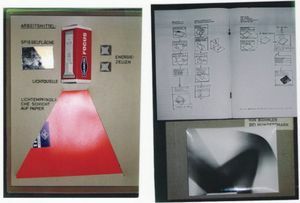 FRITZ SCHWEGLER, “4 Effechiadenstücke zum Glücke"
Four objects glass, wood and four color photocopies. 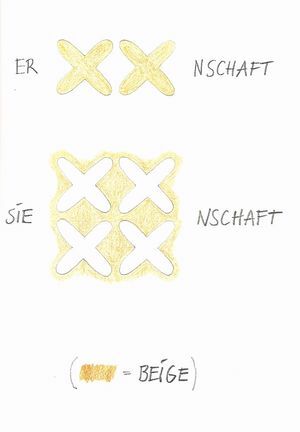 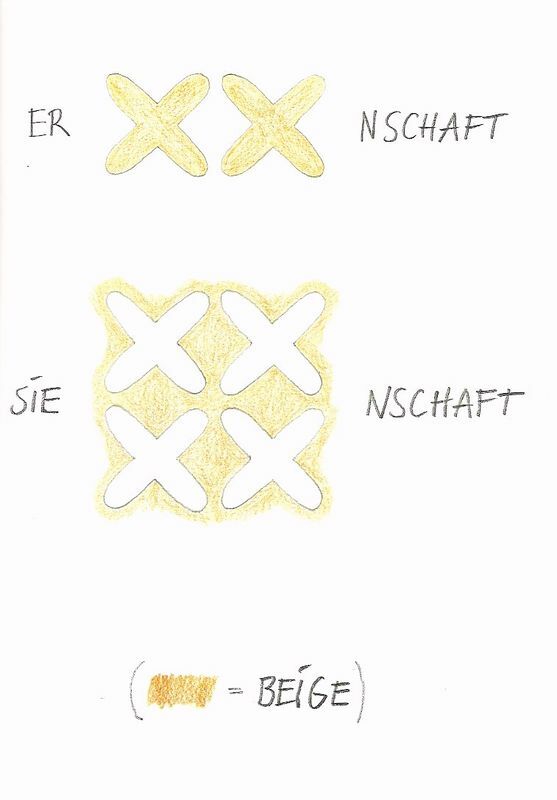 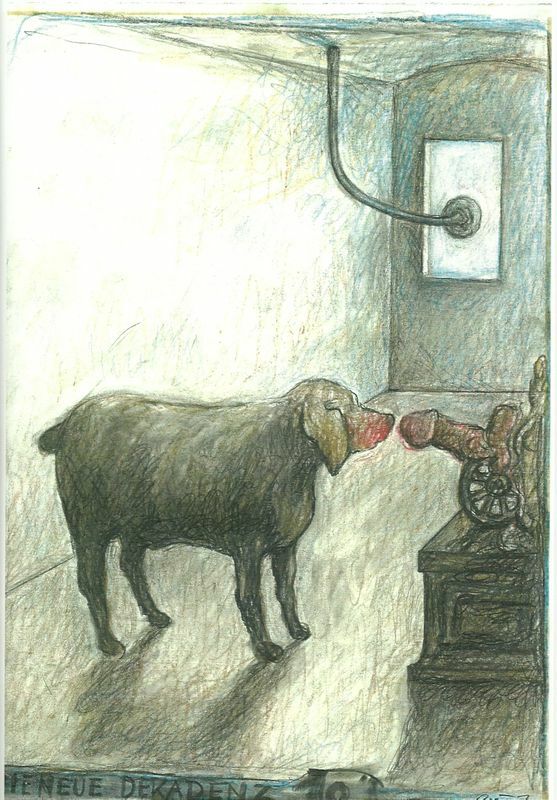 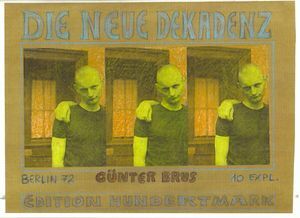 GÜNTER BRUS, "DIE NEUE DEKADENZ"
A colored drawing in a frame. 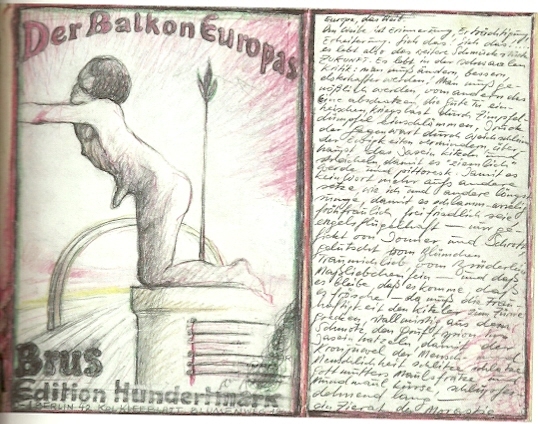 On the box is a collagierter and colored drawing title. A yellow colored wooden beam with a burned sign. 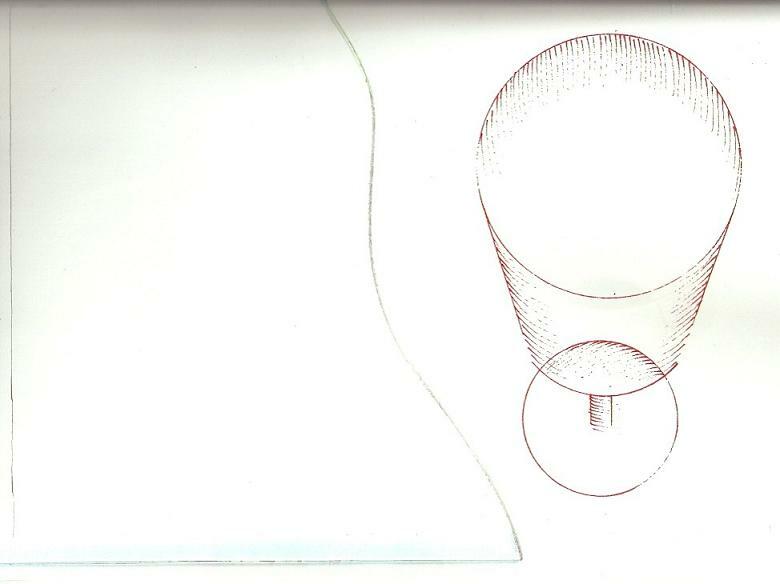 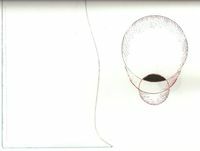 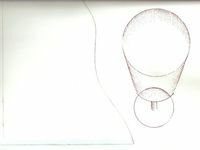 MARIO MERZ, "from the Fibonacci house 5 brocken pieces"
5 pen drawings (red and black ink) and 5 pieces of glass. 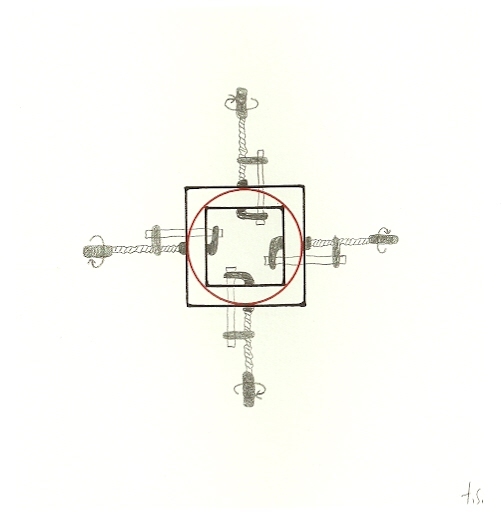 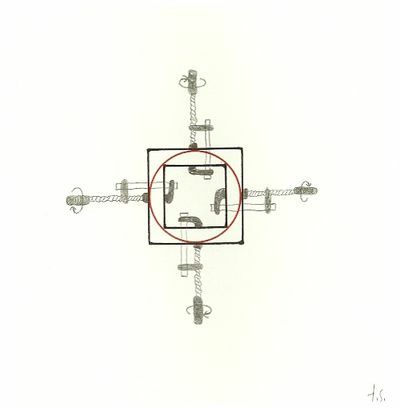 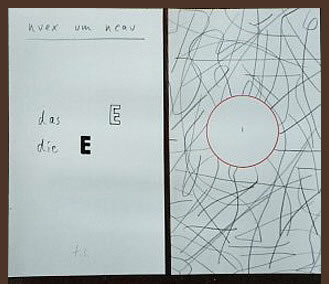 TOMAS SCHMIT, "die quadratur des kreises"
24 drawings (pencil, ink, colored pencil, collage, ink and typewriter). 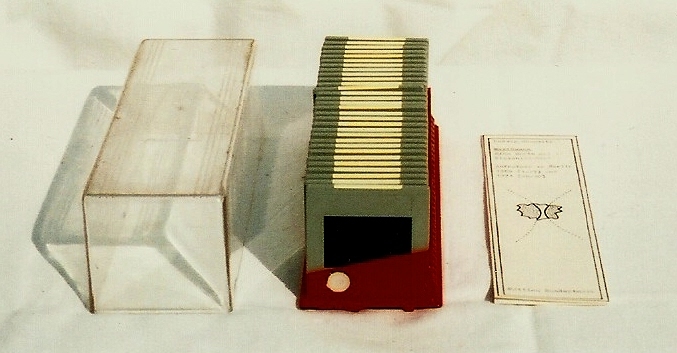 14 color drawings (Indian ink and watercolor), a color photo, a handwritten imprint and an index on a white box. 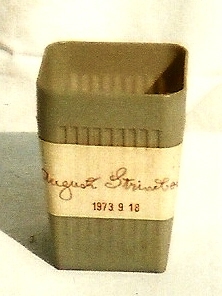 ERIC ANDERSEN, "WAST - BASKET"
A plastic container with an affixed label. 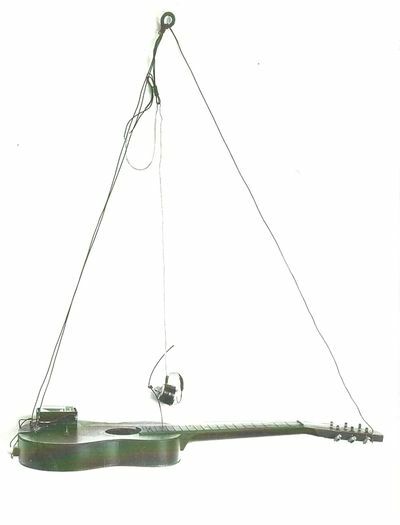 A guitar with wires, for hanging and with a battery-powered motor, which in the random rhythm strikes the sides and a handwritten warranty card. 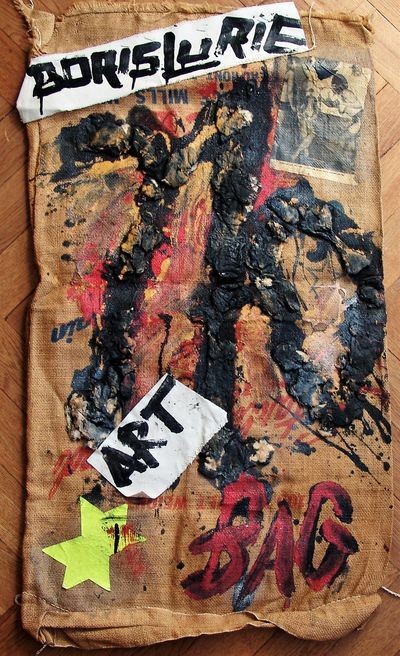 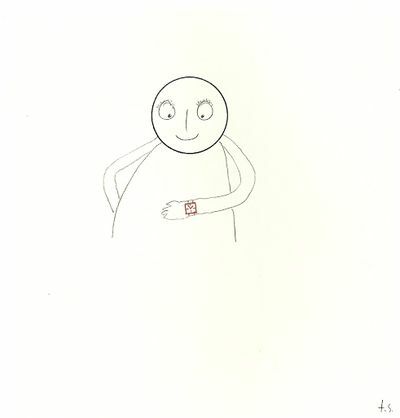 BORIS LURIE, "NO ART BAG"
Edition of 6 different copies, all objects are signed and numbered. 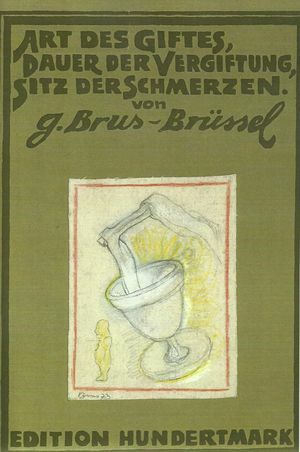 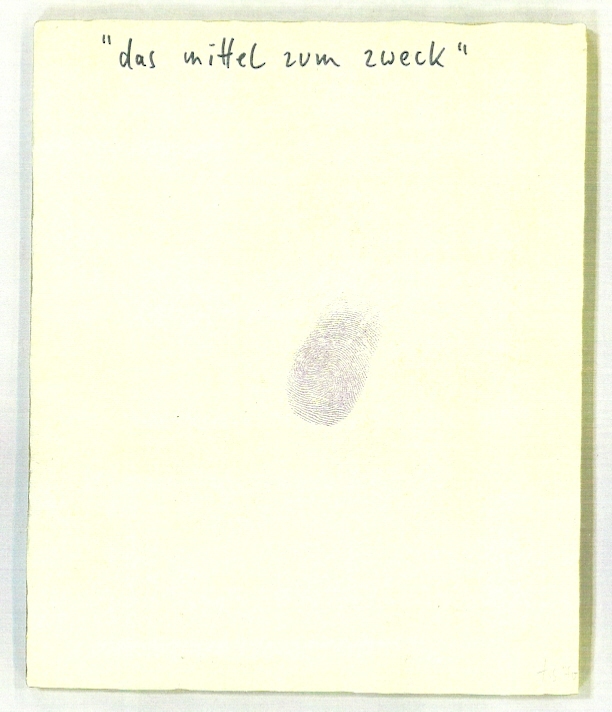 A notepad of the chemist`s shop at the Bayerischen Platz in Berlin, pencil and pen drawings, in a slipcase. GÜNTER BRUS, "ART DES GIFTES, DAUER DER VERGIFTUNG, SITZ DER SCHMERZEN"
Four pieces of white canvas at a folding cardboard, with drawings and texts (lead and colored pencil, watercolor and opaque white). 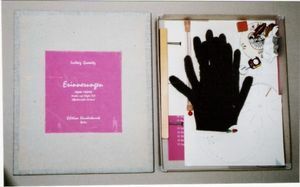 Box with a title screen and a small piece of linen glued, that has pasted a drawing. 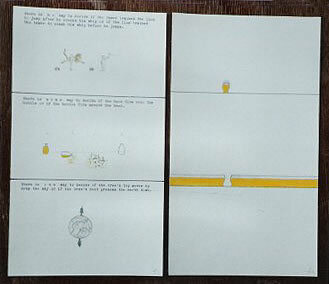 Seven drawings from 1967 - 1969 (pencil, Indian ink, Gouache), color photo, imprint and index. 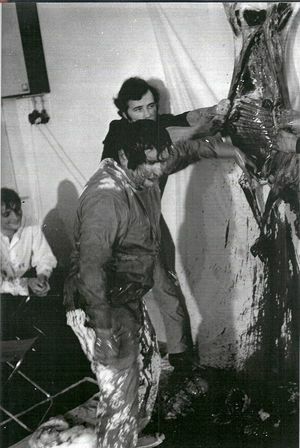 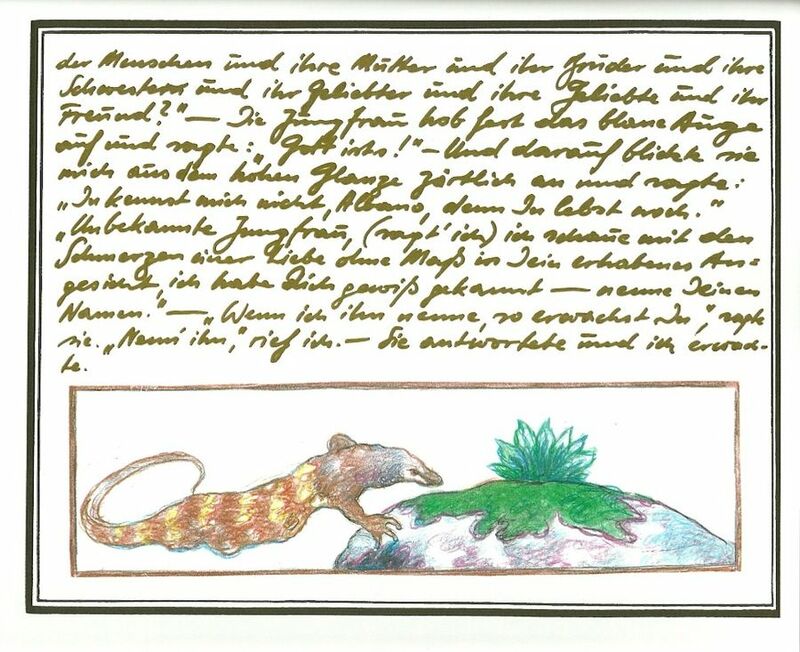 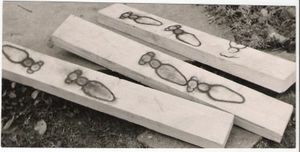 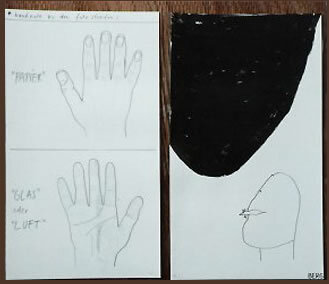 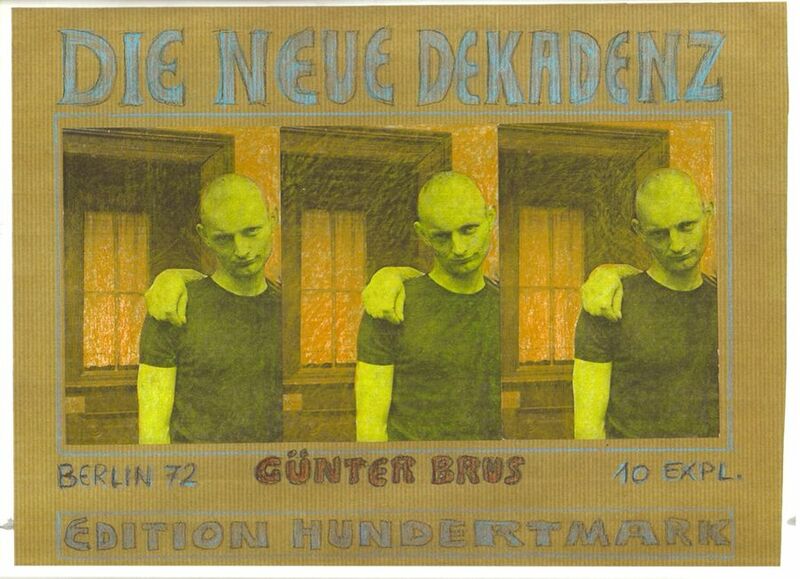 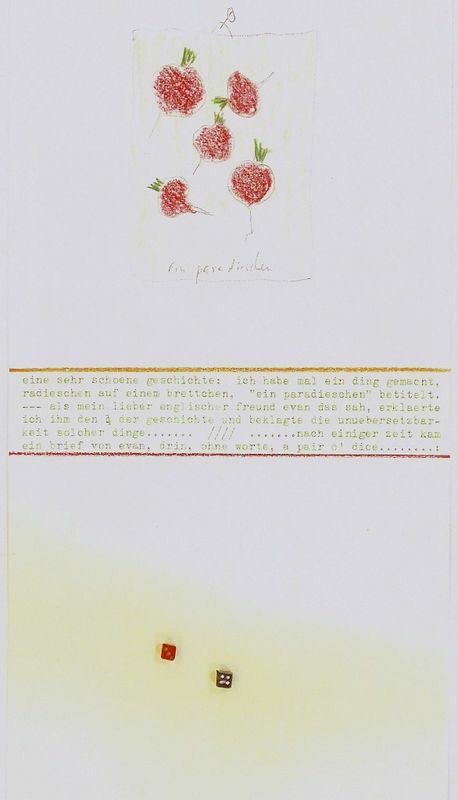 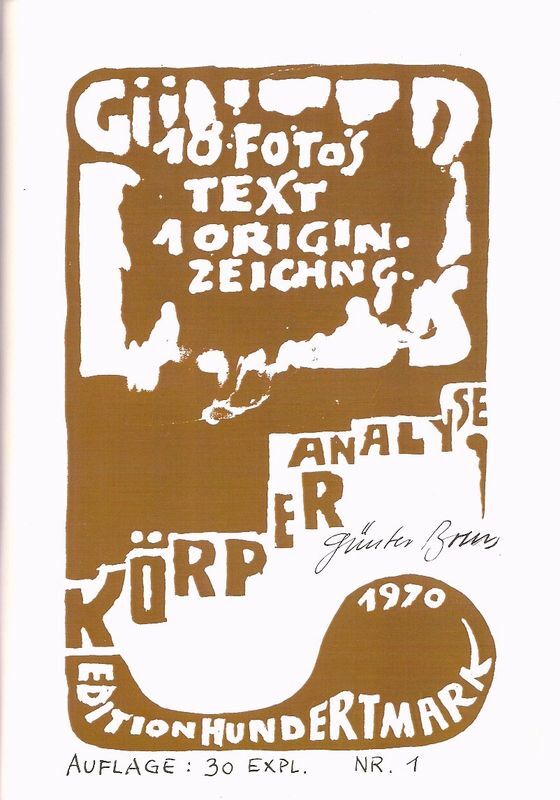 A drawing (colored pencil and opaque white) two screen prints: “Günter have paint me, I am the drop of blood” and a text “Aktionsraum…”, a color photo and four black and white photos from his last performance 1970th. 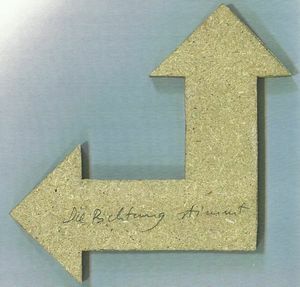 Everything is mounted on thick cardboard. 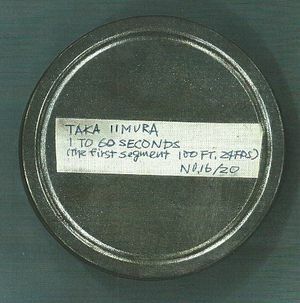 TAKAHIKO IIMURA, "1 to 100"
13 handwritten score on Japanese-paper and a 16 mm black and white movie, the first segment, 2.5 minutes. 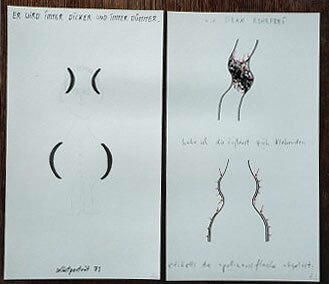 17 drawings (pencil and colored pencil, ink, typewriter). 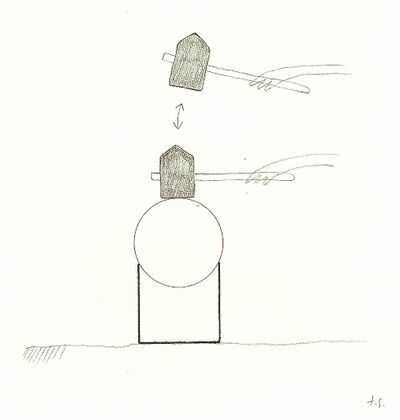 ERIC ANDERSEN, "Become a member of Eric Andersens random audience"
1st Part: From a series of 61 pitches, each a copy of a xylophone sound wood, mounted on a suitable wooden box as a sounding board, and a bobbin and a four-score. GÜNTER BRUS, "Der blaue Wald"
A cloth binding book with 40 pages, 18 color drawings, which are glued to the screen text.